I crave a shot of espresso when I know my day is getting too long and busy. I love that extra kick and adrenaline rush I get from it. But I don’t have an espresso machine at home. Instead, I typically get my espresso from a coffee shop. Since I don’t always drink espresso I didn’t bother getting a home machine. However, it made me think about coffee machines that brew coffee similar to an espresso. 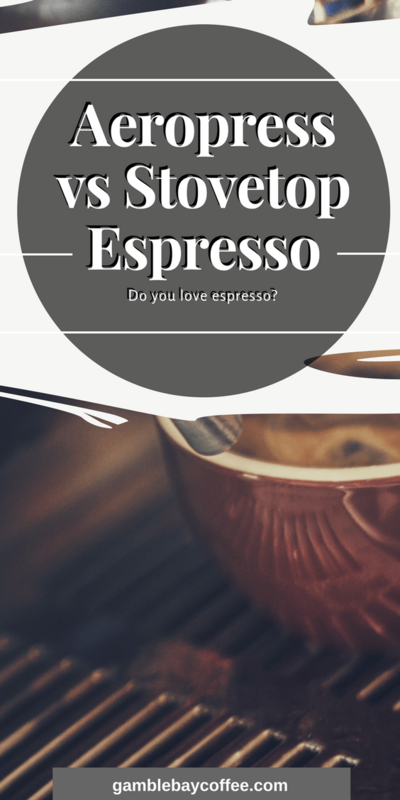 I came across two popular choices: Aeropress and stovetop espresso. Let’s take a look at these espresso makers and find out the pros and cons of owning any of the machines. When Alan Adler created the Aeropress, he came up with one recipe and one brewing style. Now there are hundreds of recipes and two very distinct styles of brewing. The Standard Method is how Adler originally envisioned the Aeropress being used, and the other method, Inverted, literally flips the Aeropress on its head. The Standard Method starts with the Aeropress sitting on top of a cup with the filter cap and paper filter in place. Ground coffee is poured in through the top, followed by hot water. The barista then inserts the plunger and presses the contents through the filter and into the cup below. An Aeropress looks like something out of a sci-fi movie and it makes good coffee, too. Many users of Aeropress compare its brew to espresso. The coffee grounds are immersed in hot water and then a high level of pressure extracts the pure coffee flavor. Because of the intensity of the pressure, brew time is less than two minutes. Can be used to make espresso, too. The resulting brew is delicious. You need specific filters for the Aeropress. It makes a single cup of coffee and not a big one. Do you wonder why Aeropress coffee tastes good? Total immersion, temperature, and air pressure play an important role. Total immersion of the grounds in the water results in rapid, yet robust, extraction of flavor. Because of the lower temperature and short brew time, the acid level of the brew is much lower than conventional brewers. Laboratory pH testing measured Aeropress brew’s acid as less than one fifth that of regular drip brew. The low acid is confirmed by coffee lovers who report that Aeropress brew is friendlier to their stomachs. One of the oldest and most trusted type of stovetop espresso is the Bialetti Moka Express. It’s been around since the 1930s. This is why stovetop espresso makers are also known as moka pots. Moka pots are humble coffee machines. Nothing fancy like the Aeropress or the Keurig. However, they will not disappoint you because they can give you a strong and delicious cup of coffee anytime you need it. The moka pot, or macchinetta del caffè, which literally translates to “small coffee machine,” is a stovetop machine that moves boiling water, pressurized by steam, through ground coffee to make a delicious brew. Back in 1933, an Italian inventor named Luigi De Ponti patented the design for Alfonso Bialetti, and the company is still making stovetop espresso makers with the same basic design. Bialetti’s classic moka pot is so reliable that it remains the best stovetop espresso maker you can buy. Before we get into our top picks, here are some key facts you need to know about stovetop espresso makers. Although moka pots don’t technically make espresso, the coffee you get is very rich and strong. Some machines will even produce a bit of crema, just like high-end espresso machines. If you’re using this to make cappuccinos or lattes at home, you’ll be more than satisfied, but if you want shots of thick, creamy espresso, you’ll need a real espresso machine. Moka pots can last years — decades, even — so long as you don’t burn the handle or otherwise harm it. The only thing you’ll need to replace periodically is the rubber gasket and filter that prevent the grounds from infiltrating your coffee. Coffee experts looked into the similarities and differences of Aeropress and stovetop espresso. The stovetop needs a stove to heat water, while the Aeropress needs only a kettle with hot water. Out of convenience, the Aeropress is easier to use because you can easily ask for hot water if you are in an office or a hotel room. While both the Aeropress and the stovetops use pressure to extract the flavor from the grind, the Aeropress needs you to do that manually, whereas the stovetops use steam from the heated water to do the job. The Aeropress is a bit more work than the stovetops here and it’s something you’ll need to learn to do with good timing to get the best results. The Aeropress filters the coffee, unlike the stovetop espresso makers, which has an impact on the coffee it produces in two ways, affecting the taste and the texture. Filtering the coffee means that the Aeropress makes a milder cup than the stovetop espresso makers, and the coffee produced is less similar to espresso in taste. The filtration process also prevents the oils from the beans getting to the cup. It is these oils which give the drink the body and flavor which is so much more similar to the dark roasted and oily espresso we all know and love. We can look at three things here: convenience, price and taste. Aeropress is very convenient to use. You can take it anywhere and hot water will not be an issue, unlike with stovetop, where you really need a stove to get it going. If you plan to drink coffee anywhere and you want to have a good cup using freshly ground beans, then Aeropress is your best choice. If you are a home buddy and want a good old-fashioned cup of joe, own a stovetop espresso. Price is also a huge deciding factor. The Aeropress is more expensive than a stovetop maker. You are actually putting a premium on the convenience of using an Aeropress. If money is not an issue, you can have both. Again, we come to taste preference. No one can really force you to like one brew over the other. It’s the type of brew that appeals to your taste. If you want a smoother and cleaner blend, go for the Aeropress. If you want a stronger tasting coffee, the kind that gives you a boost during the first hours of the morning, stovetop espresso is the runaway winner. Which one will you likely buy if you get the chance? 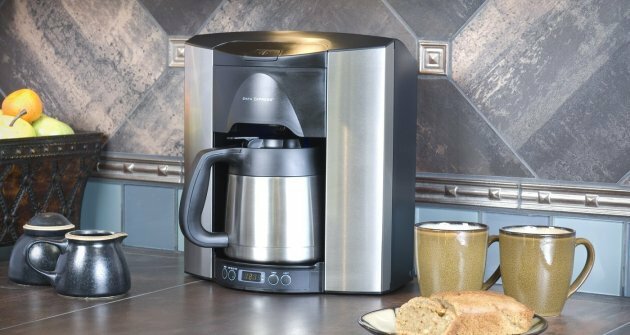 ← Is Keurig Coffee Just Like Pour Over Coffee?